Ootheca: Containing on average 6-16 eggs with a 5-14 week incubation before hatching. Nymphs: 9-13 moults taking normally 5 months to reach maturity at 25-30°C. Adults: Live on average for 15 months. Can be distinguished from nymphal stages by the presence of wings. 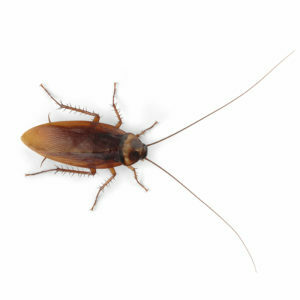 A large cockroach, 28-44mm long when adult. A shining red-brown with a paler yellow area around the edge of pronotum. Nymphs are similar in appearance to adults with the exception of wings. Males can be distinguished from females when adult by the lengths of the wings which extend past the terminal segment of the abdomen in the males. Females will produce on average 10-15 ootheca every 10months, which harden to a dark brown with clear depressions on the dorsal surface which the female will then cement to surfaces with chewed materials in prime environmental locations for ootheca development. Less of a pest in the UK it primarily infests locations near to ports as well as being found in heated locations such as zoo’s green houses and animal houses. Faecal smears in conjunction with a distinctive odour are both clear indicators of an infestation. Closer examination of likely harbourages should reveal large numbers of P.americana grouped together.